(left) Anthony Wong and Lam Chi-Chung, and (right) Teresa Mo, Lam, Gia Lin, and Francis Ng. The Skinny: Interesting and entertaining, despite possessing little in the way of a logical or coherent storyline. Dancing Lion is funny and smart, and likely a complete mystery to those not versed in local Hong Kong culture. We say this with a big fat asterisk, but Dancing Lion is worth a look. 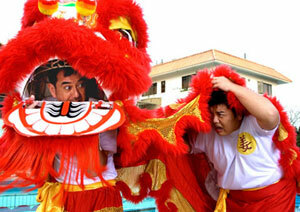 Local satire reigns with Dancing Lion, a funny but chaotic comedy that puts the "Hong Kong" back into Hong Kong film. Francis Ng stars and co-directs (along with Marco Mak) this bizarre charmer about a wacked out family and their wacked out antics, which exist thanks to the pursuit of a singular goal: money. The film's central family (consisting of Ng, Anthony Wong, Teresa Mo, and Gia Lin) is out to make some quick dough, and somehow it's lion dancing that becomes their calling. Fortysomething loser Fai (Ng) and pal Gau (portly Lam Chi-Chung) become the toast of the town thanks to their lion dancing skills, though the actual development of such fame is barely there. Here's how it happens: the pals are slackers who are threatened with layoff, and must win a talent contest to keep their jobs. They plan to perform a lion dance, but fail, only to get urged on by onlookers while they're sitting on the sidewalk looking depressed and dejected. They perform, the coins shower in, and presto: they're local heroes! What the heck? Coherence, thy name is not Dancing Lion - though to be fair, it's not tried-and-true storytelling that the filmmakers are aiming for. Writer Lam Chiu-Wing has crafted a screenplay without a supported narrative. The barebones outline of the film is this: down-on-their-luck pals become successful lion dance practitioners, whereupon they participate in a bunch of get-rich-quick schemes, fail at them, then get back up in time to win the big lion dance competition. That sounds like a familiar, Rocky-like premise, and the film's trailer - which features the stars marching to the big lion dancing showdown like extras in a Once Upon a Time in China movie - only supports that perception. Well, if that's your perceived idea of Dancing Lion, better change those expectations right quick. That plotline does show up in the film, but the stuff that connects it hardly supports it. The lead characters go through the motions of a normal storyline, but it's not where they're going that matters, but what they're doing at every single instance. Dancing Lion is not in the journey, it's in the details. So what are the details? Well, Francis Ng's character is an annoying wannabe who acts like he's in a hip-hop video despite being over forty years of age. His family has opened a speakeasy (a cafe in an apartment) to make some dough, and his sister (Teresa Mo) and niece (Gia Lin) sometimes badger the guests for hot stock tips. Once the family hits it big with lion dancing, they start to spin-off their success to death, opening a lion dance school for tykes, and even selling it as a fitness alternative for pudgy women looking to slim down. Meanwhile, Great Uncle (Anthony Wong) gets disenchanted and heads north, where he runs into Mainlanders looking to head to Hong Kong to make some beaucoup lion dancing bucks. Lion dancing becomes all the rage in Hong Kong thanks to Fai and Gau's newfound celebrity, but the downside is rampant lion dancing gangs and even turf wars. Characters drop famous names and engage in copious Cantonese wordplay. Meta-references abound; Anthony Wong pointedly uses a product that he endorses in real life, and the characters talk about how great Mandarin Films is, name dropping executive producer Raymond Wong, and even claiming Mandarin as a hot stock tip. There's also an extended sequence where the actors basically talk about how they're in an outtake. Screw the story! These guys appear to be having fun, and that's probably all that matters to them. The audience? They could be baffled or alienated. Unless you're expecting a satire freight train, Dancing Lion can be one puzzling movie. The early going is especially tough, as the actors overact mercilessly. Francis Ng's hip-hop posing is especially annoying, and some jokes pop up out of nowhere only to skulk off without gaining a laugh. Events occur with little build up or even logic, and the characters don't seem to exist beyond their basic types. It's not until perhaps halfway that the satire starts to sink in. The film offers numerous details that - once they're filtered through current events or local culture - reveal themselves as funny and informed. The film lampoons common Hong Kong culture and customs, above all the omnipresent desire to make money, money, and more money. It's a cynical way to look at Hong Kong locals, and yet it's so familiar that it feels true. Dancing Lion is at its best when it's mercilessly making fun of Hong Kong people; once the satire starts to take hold, the film hits amusement overdrive. There are some attempts at pollyannaish point-making; the script espouses the value of hard work, and gives props to the strength of family, the importance of teamwork, and probably the elastic band on Lam Chi-Chung's pants. Quite often, the film repeats the mantra that a person should work hard to develop a good foundation, rather than trying for the quick financial fix. That's an obvious and even hackneyed lesson, and the message might feel a little forced - that is, if the film weren't so intent on making a mockery of all things Hong Kong. Didactic lessons are easy to take in a satire because they're usually handled blithely and with a knowing wink. Dancing Lion is one long knowing wink. If that's your boat, then this film will float it. What the film probably won't do is convert mass audiences into Dancing Lion believers. Despite being well-informed, the film's satire is not as sharp or as entertaining as Herman Yau's Shark Busters or Edmond Pang's You Shoot, I Shoot. Those films managed to balance story, character, and satire, while Dancing Lion merely seems to throw everything into one big satire stirring pot, hoping that the audience will dive in and not drown. That's a pretty tough sell, especially since the film has character types instead of actual characters. It also delivers a couple of rather trite messages, and even resorts to a climax filled with chintzy CGI. Given that these commercial elements are given large focus towards the end of the picture, one might accuse the filmmakers of trying to have their cake and eat it too.